You must select a project before you can launch Insight. Click Open Project. The list of recently opened projects will be displayed. Select the project from the list or click More to browse for another project directory. 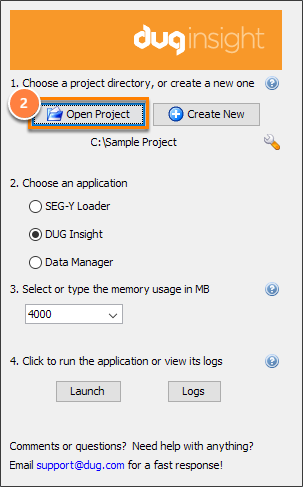 After selecting the project, click Launch to run DUG Insight. The system will prompt you to configure the CRS when you launch a project without specifying the project CRS. A valid project must have its CRS defined or at least the X/Y unit specified. 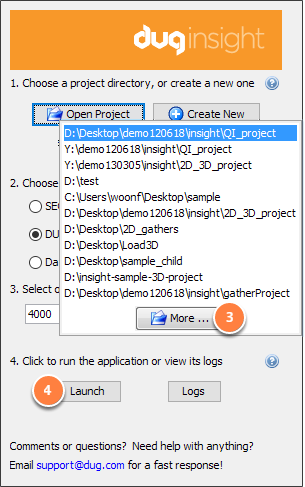 Tip: To configure the settings of an existing project, including project CRS, datums and backup settings, click on the spanner icon in the Insight Launcher (see Configure a Project).